Bright start to 2018! Congrats to my colleagues, Agnes Chuah, Alisius Leong, & Chris Cummings for getting our manuscript on “Label It or Ban It? 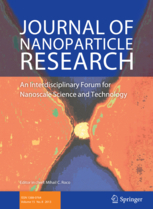 Public Perceptions of Nano-Food Labels and Propositions for Banning Nano-Food Applications” accepted for publication at the Journal of Nanoparticle Research!